The cost of the expedition includes photo shoots, sightseeing and transfer services as per the itinerary, all accommodations, meals as per the itinerary, guides/fixers (subject to locations), a driver and vehicle for transfers from and to the airports, and land travel in India. It does not include any expenses of personal nature, laundry or any beverages. The cost of international flights from the USA (or elsewhere) to and from India are not included, and must be arranged so that you arrive in India (Delhi or Mumbai) on 23 January, 2010. Depending on participants' international flights (arriving/departing to/from Delhi or to/from Mumbai), two or three internal flights are available. For those choosing Delhi, the first flight is from Delhi to Udaipur, then a flight from Bhuj-Mumbai, and a Mumbai-Delhi flight. For those opting to internationally fly in to Mumbai, the flights are Mumbai-Udaipur, and Bhuj-Mumbai. A deposit of $300 is required to secure a place on the Nomads of Rajasthan & Gujarat Photo Expedition. This down payment is fully refundable if notice is given 60 days prior to the departure date. The balance of the cost is due 60 days prior to departure date. Although the Baneshewar fair is regarded as safe, the annual cattle fair is visited by thousands of people, whose presence may bring pickpockets. So leave anything of value at home! We shall be staying in a variety of hotels during this photo-expedition. In Delhi or Mumbai, our hotels are amongst the best 5-star establishments, while those in the "field" in South Rajasthan and Gujarat are known as Heritage hotels, and are essentially are forts, palaces, mansions and havelis converted into comfortable accommodations for tourists. All accommodations have attached private baths. In the Rann of Kutch, we will be staying in cottage-like accommodations, also with attached private baths. I assume no responsibility for accidents or injury to individuals participating in the Nomads of Rajasthan & Gujarat Photo Expedition. You will be requested to read, accept and sign an agreement which releases me from any responsibility of liability in the event of any of the situations mentioned below. I cannot assume any liability whatsoever for injury, sickness, damage, death, loss, accident or delay to person or property due to an act of negligence of or default of any travel agent, hotel, carrier, restaurant, company, airline, or person rendering any of the services included in the Nomads of Rajasthan & Gujarat Photo Expedition, or by act of God, act of war or terrorism. Further, no responsibilities are accepted for any damage, changes or delays due to sickness, pilferage, labor disputes, machinery breakdown, quarantine, government restraints, weather or other causes beyond my personal control. No responsibility is accepted for any additional expense, omissions and schedule changes, forced stopovers, rerouting or acts of any governments or authority. I reserve the right to decline or accept any person as a member of any tour or to cancel or alter the tour without notice. It is also the responsibility of the traveler to keep informed on deposit and payment date requirements. It is highly recommended that all individuals obtain adequate travel insurance. 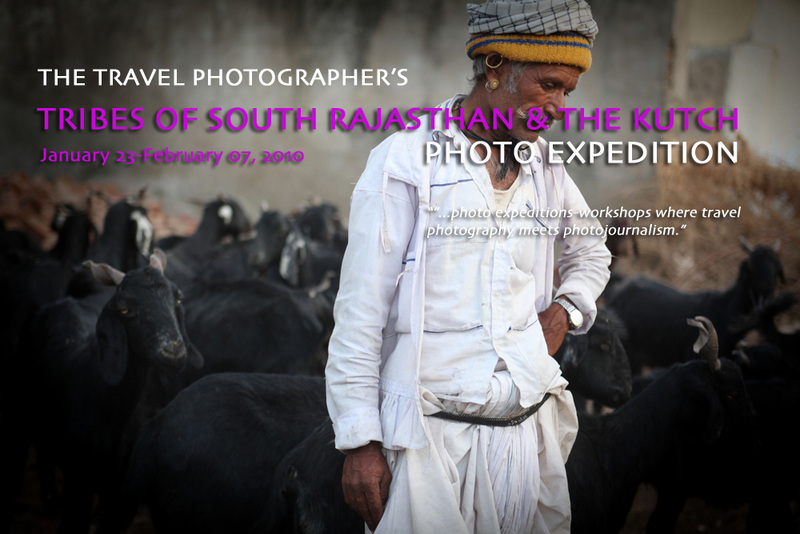 Southern Rajasthan and Gujarat's Rann of Kutch are the two main areas we intend to explore during this photo~expedition, along with the exciting Baneshwar cattle fair. Our focus will be on documenting the bustle of the fair (a real authentic cattle fair and festival; unlike the now over hyped Pushkar fair), and capturing compelling photographs of the various tribal cultures that populate the areas. Some of the best photo-ops will undoubtedly be found in the small rural villages scattered in the geographical triangle of Dungarpur-Baneshwar-Bhuj. The tribal Bhils attend the Baneshwar Fair, and sing traditional folk songs in high pitched voices sitting around a bonfire every night. Apart from the selling and buying of livestock, the fair has its share of folk dances, itinerant musicians and acrobats. This will provide us with a myriad of opportunity not only to photograph, but also to capture the unique sounds of this folk culture. In Southern Rajasthan and in Gujarat, we will come across the various tribes and sub-tribal groups such as the Banjara, the Gowdia and Garacia, the Rabaris and the Jats. The Nomads of Rajasthan & Gujarat Photo-Expedition is ideal for participants interested in documentary photography, ethno-photography and multimedia, and for those ready to create visual projects from their inventory of photographs, and learn how to control story length, intent, pace, use of music and ambient sound, narration, field recordings and interviews. Tewfic El-Sawy is The Travel Photographer, a freelance photographer who specializes in documenting endangered cultures and traditional life ways of Asia, Latin America and Africa, has been organizing and leading photo expeditions since 2000. He's passionate about documentary-travel photography and produces multimedia stories, merging still photography and ambient sound, as well as musical soundtracks. His favorite destination is India, which he visited no less than 15 times. More information is available at WHO IS THE TRAVEL PHOTOGRAPHER? Important Notice: Nomads of Rajasthan & Gujarat Photo-Expedition is limited to 8 photographers on a "first registered first in" basis. I'm unable to accept any more due to limited accommodation in some of the hotels.